We love to keep our appointments running as smoothly as possible. To help us, please call to book your pet a consultation or use our online booking system. Welcome to Doyalson Animal Hospital! Doyalson Animal Hospital is conveniently located on Scenic Drive Doyalson, just near the traffic lights. There is a large customer carpark down the back so please come down the driveway to access the hospital. Please feel free to have a look around our extensive site – sign up for our monthly newsletter, meet our vets and nurses, and learn how to share the good times with your pet. At Doyalson Animal Hospital, we value our clients and above all we value their pets health. 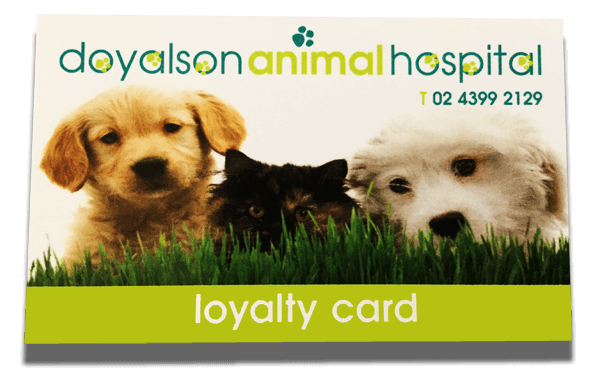 Ask us about our Loyalty Cards, and unlock ongoing value for your pet. 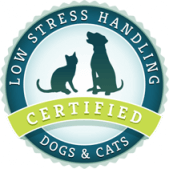 We are a low stress handling certified clinic! We are committed to providing up to date, effective and safe handling techniques every time your pet visits our clinic. For every vaccination you give your pet, we will make a donation to support farmers in the Hunter region.